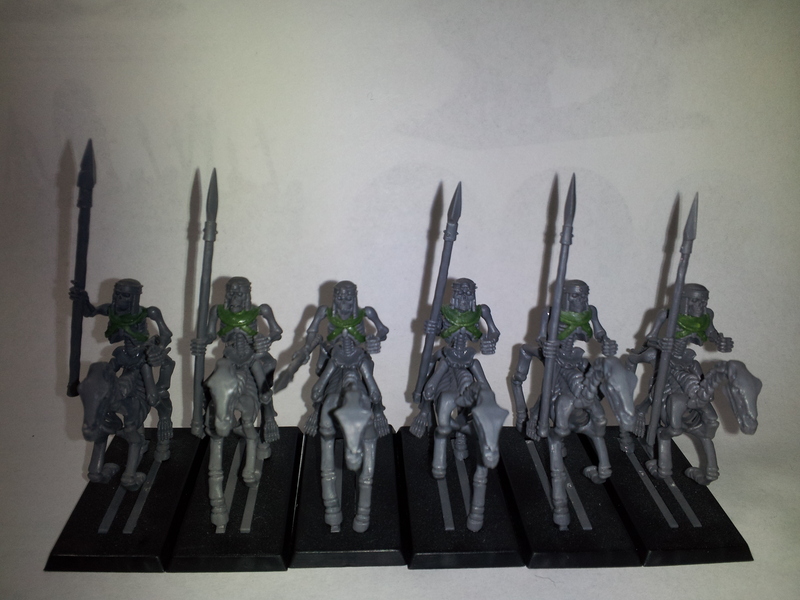 My Tomb Kings already has the start of having quite a few minor conversions and will at sometime include a huge one. These are the some of my completed conversion sculpt work. This is a really simple conversion I did to my Casket of Souls. I’m not sure that people actually notice at all. I just chopped up and reposed the birds to resemble the angels on top of the Ark of the Covenant from Indiana Jones. This was my first real sculpting attempt ever and it’s not too bad. I just added armor to my heavy horsemen. 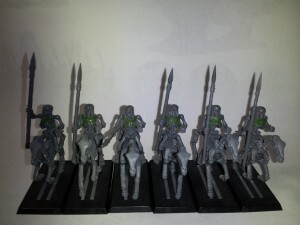 I only did these six and they were in my previous edition army to be unvailed by the banner of the hidden dead. 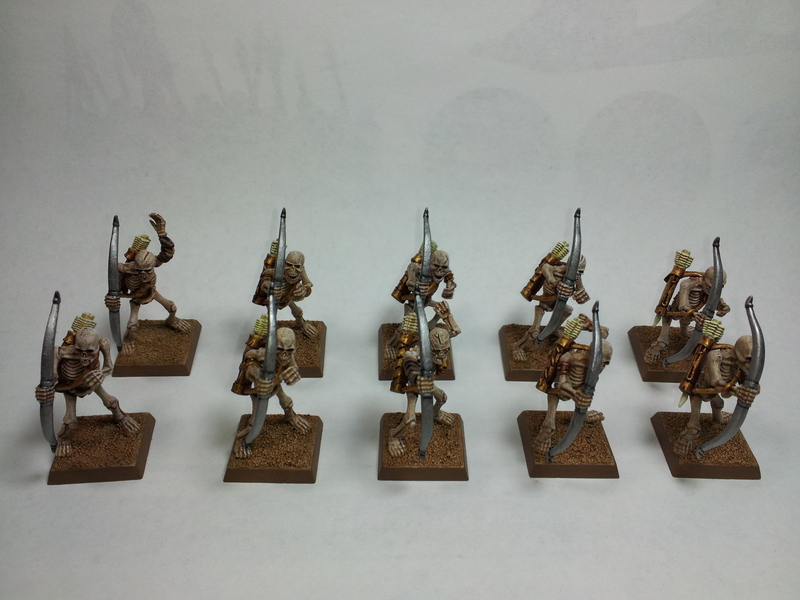 I consider adding appropriate armor to all skeletons but that’s an awful lot of effort for the models it would be on. This was my next sculpt, it’s a little more involved and actually took quite a while but I am rather pleased with the result. I made this unique weapon for this anubi Ushabti. It was inspired by the weapon used by Imhotep while fighting O’Connell in the Scorpion Kings pyramid. 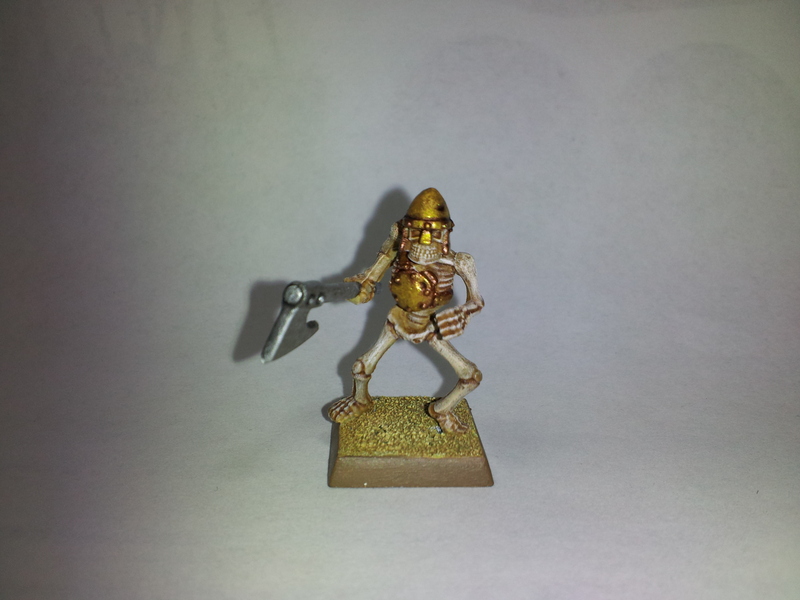 The skeleton archer unit was the first thing I undertook with my new found painting confidence after completing my first model using “How to Paint Citadel Miniatures”. It took my a long time to find the time to finish it so was my hobby goal many times on the show which I have finally completed. I have some issue with how my base color turned out and have tried to correct it but haven’t figured out what I need to do differently. Although this is another not very good pic it is accurate that the base color compared to my test model is much darker and more brown. I am fairly sure I used the same colors and technique and have also tried changing it but can’t get it to match the lighter more yellow color of my previous model. 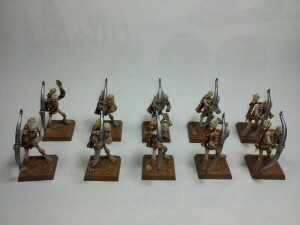 These models also incorporate as part of my theme, the Army of Ptra, my attempt of painting “arrows of light”. It is unfortunately really indistinguishable in the pic but I think it ended up well in color terms and I’m anxious to see if other people think I pulled it off well enough. The inspiration for the “arrows of light” also came from the movie Immortals, specifically the Eprirus Bow. I thought it was a neat fit with the arrows of asaph rule to have the army of Ptra, the sun god, fire arrows of light. Hope to have better pics added soon. When GW released “How to Paint Citadel Miniatures” I used it to paint what is more or less my first mini and it was a feature on the show about painting. Unfortunately it is not a great pic which I will have to see about changing but it gives you the general idea. Like we said on the show the book really gave me confidence to paint my first mini. The final product, although not spectacular painting award stuff, I think is very respectable and most importantly I am so happy to be able to put it on the table. The big hump for me to overcome was knowing that I could paint something I would be satisfied putting on the table. 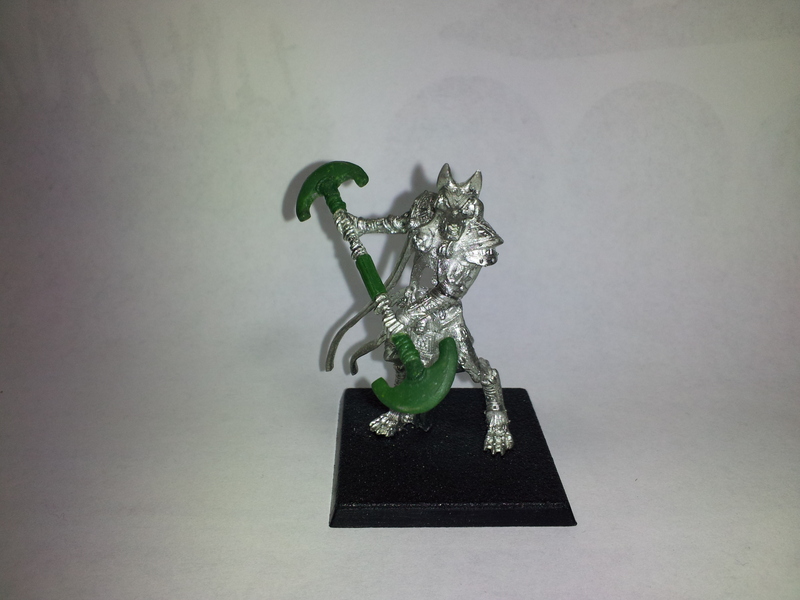 This model was my first and the test for the color scheme of gold armor and silver weapons. I really dig it and think it worked out well and seems really cool for Tomb Kings. It has been commented that the weapon looks very odd/plain being completely bright silver. I don’t want to stray for my complete single color theme and think the big axe is a bad example because of its large area so it shouldn’t be an issue on the actual Tomb King models. Another tidbit is I actually chose a flesh color (Eldar Flesh) for the main color/dry brush layer but it seems rather unnoticeable being so similar to an ordinary old bone color. I hoped using a flesh tone would create a ghostly semblance to the bone of a live person. Maybe I should try painting a skeleton with complete flesh shades just to see how it looks. I don’t think it would work but would be cool to try. 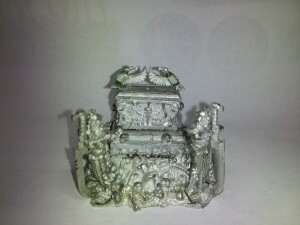 My Tomb Kings work was a main focus of my hobby for a while so it has come up many times when I have been on the show. I have had this army for many years but like all the rest of them it is far from acceptably complete. I have a few big projects in mind that I am yet to start and aside from them there is a ton of assembly and especially paint to be done. This idea was slowly grown over time from my search for inspiration of what color/s to paint my Tomb Kings. I always wanted them to be rather bright and, out of ordinary for Tomb Kings, untarnished/aged. What would be the reason they didn’t succumb to the harsh desert climate? Also what color would this be? I think both of these ideas came together when I saw the movie Immortals. The gods in the movie dawned completely gold clothes/armor and bore silver weapons which I thought was pretty cool looking. I could do this with my Tomb Kings! The idea was more readily linked in my mind by my previous idea of the army being an army of a god which came from the Mummy Returns movie: the army of Anubis controlled by the Scorpion King. Then with the Epirus bow in Immortals firing arrow of light it dawned on me to make my Tomb Kings the Army of Ptra, the sun god, and also including Scorpion King Monster/Necrosphinx (If you smell what the Rock is cooking!). The Necrophinx not being a character model lead me to think who would general this army? I also found my answer from The Mummy Returns, how Imhotep could gain control of the army of the god(Ptra) and Scorpion King, he would be the general. Imhotep is a BAMF and I’m yet to figure out how to represent him. It may be a special character; Settra, a Tomb King and Hierophant combined and wielding the Blade of Ptra but seems to weaken the magic not being able to include a level 4 at reasonable point sizes; Khatep also THE High Priest but leaves plenty to be wanted in combat; or a generic king or priest but don’t seem nearly powerful enough to be Imhotep. Khalida is a cool option to double as Anuk-su Namun too. The hosts travel to a new store in the Wausau, WI are for games and chat with Prism Gaming owner Scott as well as Mike Ballard from the Wausau Wierdboys. Back in the studio, the boys talk about getting your bud to 1000 points for a good foundation on a reasonable budget. Make sure you check out R.O.E. (Rules of Engagement) Games and Hobbies in Schofield, WI. We fill up the studio with a bunch of the Madison locals and have a bunch of announcements, recap what we have been doing in the hobby and gaming and cover Waaaghpaca. In there, we talk about the Draksull Menace figures from Titan Forge, Gaming Spotlight, and a few cheese curds were thrown around. Also, Conesy spends some time talking with Rob from WarGenius.com and explore what is a great wargaming social website with some amazing features for the grand cost of nothing. Go, check it out while you listen to this show!